Odisha at a Glance: Famous Tourist Places of Kandhamala District of Odisha (Orissa) With Temples, Picnic spots at Water Falls, Deep Forests High Hills and Ghats. Famous Tourist Places of Kandhamala District of Odisha (Orissa) With Temples, Picnic spots at Water Falls, Deep Forests High Hills and Ghats. 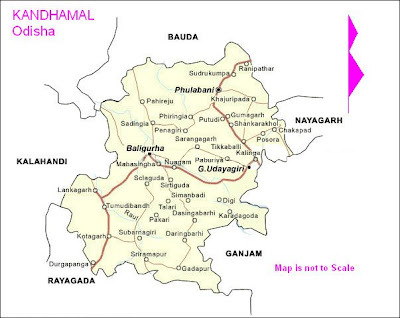 Chakapada: 60 kms from Phulbani. It is famous for Lord Birupakhya temple. Putudi: 15 km from Phulbani .It is famous for the picturesque waterfall. Daringibadi: It is 335 km from Bhubaneswar and is a hill station surrounded by dense forest. Chari sambhu: This place is famous for Bishnu temple.